A stethoscope cover makes a great thank you gift for your favorite doctor or nurse. 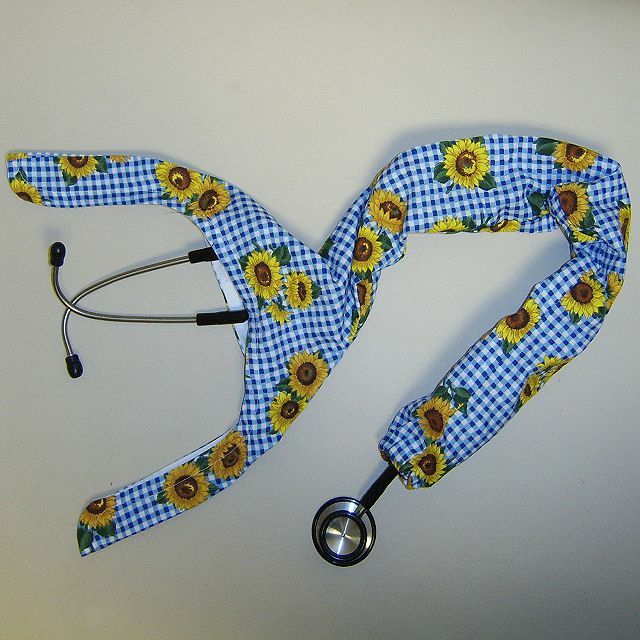 Make them in bright, cheerful or comical fabric to distract someone to distract someone from the real need for a stethoscope. Newspaper or pattern grid material, a yard stick and pencil to create the pattern. Start with a piece of paper or pattern material that is at least 34" tall by at least 12" wide. Fold the 34" length in half and form a strong crease to work from as a center point. This will allow you to keep both sides even. Mark off the measurements shown in the photo. Lightly sketch in the curved lines. Fold the length of the pattern in half and cut out the pattern, leaving the fold intact. Use the fold line on the pattern piece as a straight grain-line to cut out two of the pattern pieces out of your fabric. Place the cut-out fabric pieces, right sides together, aligning all the edges. Using a 1/2" seam allowance, seam from the top to the bottom on one side. Turn under 1/2" of the edge, bringing wrong sides of the fabric together. Turn under again so the raw edge is enclosed. Sew as close to the edge as possible to create a casing for the elastic. Although you only need 4" of 1/4" wide elastic, it is easiest to not cut the elastic before you sew it in place by using the following method. Mark 1" from the end of the elastic and again 4" from the 1" mark. Place a small safety pin on the one-inch end. Use the safety pin to guide the elastic through the casing. Keep the elastic flat, untwisted and smooth. Guide the elastic through the casing so the 1" mark is at one end of the casing and the 4" mark is at the other end of the casing. Use the "tails" of the elastic to hold it in place while you sew the elastic in place at the ends of the casing. Trim the elastic to the ends of the fabric casing. Push the "gathered" fabric to the middle area of the casing so the ends of the casing are smooth. Align the edges with the right sides together. Sew a seam in the second side of the cover using a 1/2" seam allowance, sewing the same distance that you did for the first side. Lay the right side of the bias tape on the right side of the fabric at the top edge of the stethoscope cover. Open the edge of the bias tape and align the edge with the edge of the fabric. Fold the end of the bias tape so the raw edge will end up enclosed. Sew in the crease of the bias tape to attach the bias tape to the fabric. Continue all the way around the top opening of the stethoscope cover, ending with the end of the bias tape on top of the folded under end. Trim away any excess bias tape. Trim and clip where needed so that the bias tape will lay flat on the wrong side of the fabric on the top opening. Press in place, easing in any fullness if necessary. Hand sew snaps as shown in the photo to secure the stethoscope cover.